I used to spend quite a lot of time in Chelsea, years ago, when my sister lived off the King’s Road. One of our favourite meeting places was Oriel which was a minute from Sloane Square Station. Sadly Oriel closed down a while back – due to some local politics with the landlord I believe (some say he was served a bad meal and wouldn’t renew the lease). The place was always heaving so they really should have focussed more on keeping their landlord happy. After a long wait and a refit it reopened in 2012 as Colbert. Corbin & King, the people behind the Wolseley and Delaunay (and Brasserie Zedel, one of my favourites) were the fortunate winners of what I can only imagine must have been a highly competitive tender. I mean this is the spot to have a restaurant, kind of on the edges of Belgravia, Knightsbridge and Chelsea. Colbert says they are inspired by the great boulevard cafes of Paris and the feel of the place and the menu are very Parisian. I love a chopped salad so couldn’t resist this one. 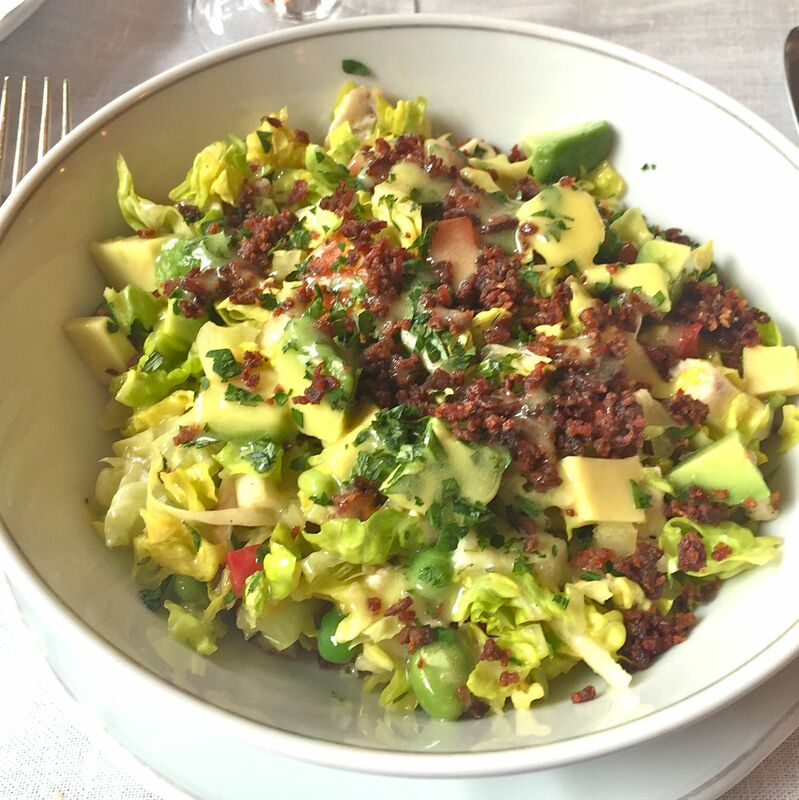 Chopped chicken, avocado and bacon on crisp lettuce with an amazing dressing. All ingredients perfectly prepared. This is one heavenly salad. All the dishes in the salad section is extremely tempting – I could eat them all. 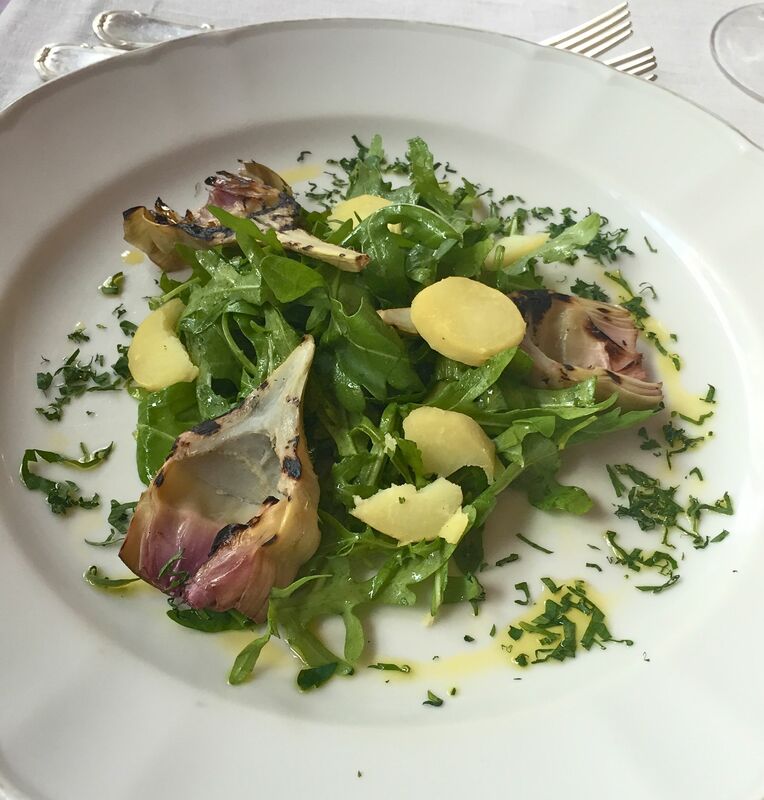 This pretty plate of food was made with fresh artichokes, herbs, warm potatoes and a lovely dressing. A real treat to have fresh artichokes which are just too much of a palaver to prepare yourself. And how’s this for a classic French dish. Confit de canard served with frisee. 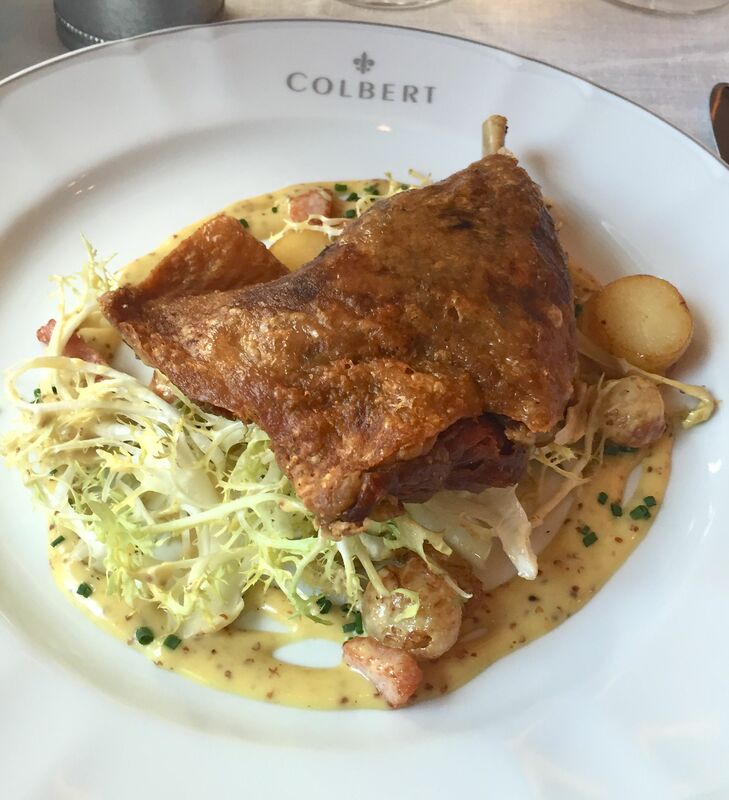 The duck was beautifully crisp on the outside and melted in the mouth, its richness perfectly offset by the light and fresh frisee and a wonderful mustard dressing. And here’s another classic…steak tartare. 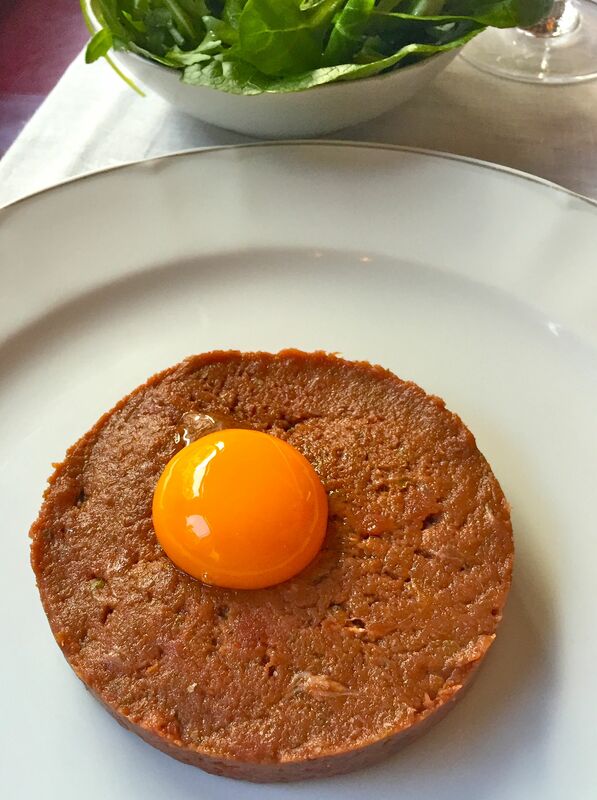 Served finely minced with a vibrant orange egg yolk on top and a green salad on the side. Colbert is open all day and you can pop in for a drink as well as a meal. It is an extremely busy place with a great atmosphere and some of the most welcoming service I’ve recently had in London. So book, as you may well be disappointed if you’re hoping to grab a spontaneous table. And that wouldn’t be good! 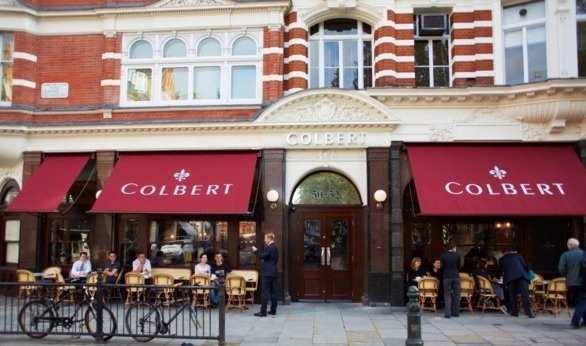 Colbert is at 50-52 Sloane Square about a minute from Sloane Square tube station.